Greetings, Earthlings and food-lovers alike. Welcome back to our blog! If you’re in the Virginia Beach area and you’re on the hunt for some noms, be sure to check out our restaurant. We serve up seafood fresh from the ocean and pizza fresh out of our open flame oven. Food at our restaurant simply tastes better. However, while a good chunk of the population is brave—or just curious— and will come into our restaurant and feel comfortable ordering one of our signature creations, there is one faction that refuses to stray from simplicity. 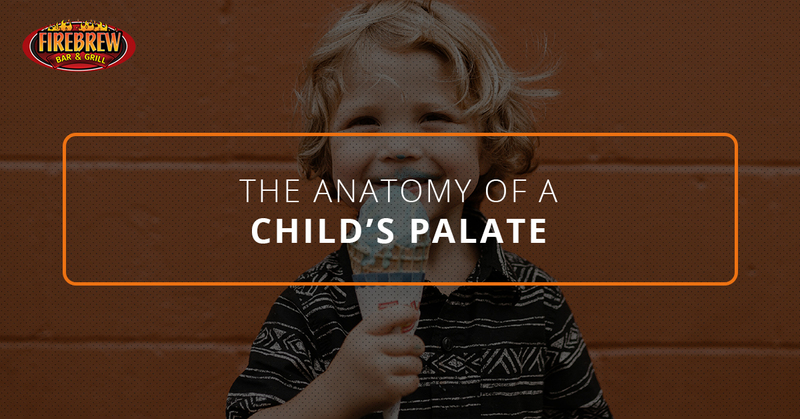 We call this section of the population “children,” and today, we’re going to talk about the anatomy of child’s palate and what you as a parent or guardian can do to help them. You’d swear the world’s chicken population would have gone extinct by now based on all of the orders of chicken fingers and fries that children have requested. It’s a monstrosity! Sure, a good chicken finger meal is tasty, but for every meal? Yikes! What’s even worse is that these buggers eat them plain; no BBQ sauce, no ranch, no ketchup, no nothing. We’re getting the heebie-jeebies just thinking about it. Even the fries sitting beside the nuggets are topped with nothing but some salt. What the heck?! Did you say plain cheeseburger? That was painful to hear. If you order a plain cheeseburger, you might as well have just ordered a cow with a piece of cheese on its head. Sure, we might be biased because we have some of the tastiest and most creative burgers in all the land, but that doesn’t mean we’re wrong. If you’re going to get a burger, let it be smothered in cheese, condiments, fresh lettuce, tomatoes, and onions, and served inside a fresh and seasoned bun. We’re having none of this “plain cheeseburger” nonsense. Please, help your child. We’d like to start this by reaffirming that spaghetti is not a synonym for pasta. Spaghetti is a type of pasta but pasta is not a type of spaghetti, people! Sure, marinara sauce can be yummy, but a bowl of noodles topped with some marinara sauce sans cheese, veggies, and other yummy ingredients, is a sad, sad sight. Pasta is meant to be delightful, delicious, and delectable. A good dish stays with you for years while a plain excuse for pasta stays with you for maybe the bite that it is in your mouth. Introduce your children to the finer things. Trick them: Yes, sometimes you have to be sneaky. Slip a little sauce on their burger or sprinkle their chicken fingers with some cajun seasoning. Don’t tell them and be subtle and monitor their reaction. Bribe them: Nothing quite entices a child like the shininess of a five-dollar bill or the promise of ice cream. Regardless of ethics, use the bribe! Tell them they can’t have it: What’s something that every child ever wants: something they can’t have. Tell them they can’t order anything other than spaghetti, a plain burger, or chicken fingers. They’ll be ordering the honey sriracha salmon in no time. We wish you luck, parents, and guardians! Come into FireBrew Bar & Grill today for assistance and some yummy-as-heck food.